Not exactly the road trip from hell (that honor goes to PLANES, TRAINS AND AUTOMOBILES), but DUE DATE swings so close to hell that you might as well make the detour and visit the gift shop. Kicked off a cross-country airplane flight for causing a disturbance, his wallet and luggage lost, business traveler Peter Highman (Robert Downey Jr.) must resign himself to hitching a ride with the passenger who caused him to be kicked off, aspiring actor Ethan Tremblay (Zach Galifianakis). Trying to make it back to Los Angeles before the birth of his first child, Peter must tolerate the outlandish quirkiness (some might call it retardation) of Ethan, who carries his dead father’s ashes in a coffee can, has no clue how to approach acting (except to throw in the phrase, “What are you, a girl or somethin’? !” at regular intervals), and isn’t averse to masturbating himself to sleep in a car seat whilst speaking to Peter inches away in the back seat. We’ve all met Ethan. We’d love to strangle him, as blissfully unaware as he is of his social ineptitude and lack of talent, but we don’t, due to our etiquette of not strangling really really really annoying people that are too slow to realize they are. In this movie, we’d like Peter to do our strangling for us; the fact that he doesn’t, though his temper is often redlining, is what makes the movie believable, grounding it in a hellish reality we’ve all been to before. Ethan’s foibles (and Peter’s lack of strangling him) get the pair into one sticky situation after the next – bitchbeaten by an irate “handicapable” Western Union employee (ever-dependable Danny McBride), detouring to score Ethan’s drugs from a trailer-trash mother Juliette Lewis (somehow, this role keeps perfectly fitting Juliette Lewis), involved in a massive car accident due to Ethan sleeping at the wheel, are rescued by one of Peter’s buddies (played by Jamie Foxx – which opens up questions on whether Peter’s wife (Michele Monaghan) is having an affair with Foxx), and are arrested by Mexican drug enforcement officers. 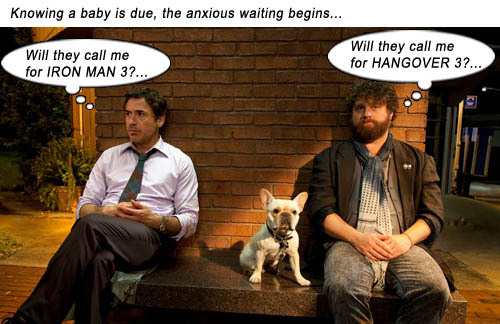 DUE DATE’s comedy works best when pitting the two personalities of its principals against each other: Downey’s insouciant businessman (honed to a zenith in the IRON MAN series) scraping against Galifianakis’s incognizant idiotman (which he has spent his career honing, most notably in the HANGOVER series). In one poignant scene, we actually see these two fine actors stretching beyond their types, when Peter challenges Ethan to do an acting scene in a roadside bathroom, to prove he’s got what it takes to improvise. We can actually witness the point where Galifianakis makes Ethan cross over from “bad performance” (where he throws out the obligatory, “What are you, a girl or somethin’?”) to alluding to his loneliness at the loss of his father. The mark of a good actor is how well he can act badly (as Geoffrey Rush shows us in THE KING’S SPEECH). And then Downey actually tops Galifianakis with tales of his own callous father. To top off that fantastic performance, Ethan’s response to Peter’s tragic tale is uproarious laughter – not just inappropriate, but incognizant of the gravity of relationships, “My father would never do that to me! He loved me!” And that seals this movie as a gem for performances. Then it jumps the shark. Written and co-directed by Todd Philips (THE HANGOVER), DUE DATE is not absurdist comedy, so though it can get away with Danny McBride in a wheelchair running hogwild with a nightstick, it can’t just stage a massive chase scene on the freeway from Mexican drug police, with damaged property, stolen property, shots fired, etc. and then have NO REPERCUSSIONS. Is this the real world or David Cronenberg? A question I often ask myself when stuck on a road trip with an incognizant idiotman. Writers: Alan R. Cohen, Alan Freedland, Adam Sztykiel, Todd Phillips. Starring: Robert Downey Jr., Zach Galifianakis, Michele Monaghan, Jamie Foxx, Juliette Lewis, Danny McBride, RZA.